Plants contain natural primary and secondary metabolites, including flavonoids, saponins, alkaloids, steroids, coumarins, tannins, phenols, terpenoids, carbohydrates, proteins, and amino acids. Recently, plant extracts have been utilized for the synthesis of nanomaterials, specifically metallic nanoparticles such as gold, silver, titanium oxide, copper, palladium, zinc oxide, and platinum nanoparticles . Diverse phytochemicals actively participate in converting metal salts to metallic nanoparticles as reducing agents. In addition, plant extracts play a role as stabilizing agents to maintain the colloidal stability of metallic nanoparticles in solution. Chemical reducing agents are generally noxious and toxic to living organisms. By contrast, the use of plant extracts in the synthesis of metallic nanoparticles is green, eco-friendly, and sustainable. Various plant parts, such as stems, fruits, seeds, leaves, and flowers, are utilized to synthesize metallic nanoparticles [1, 2]. 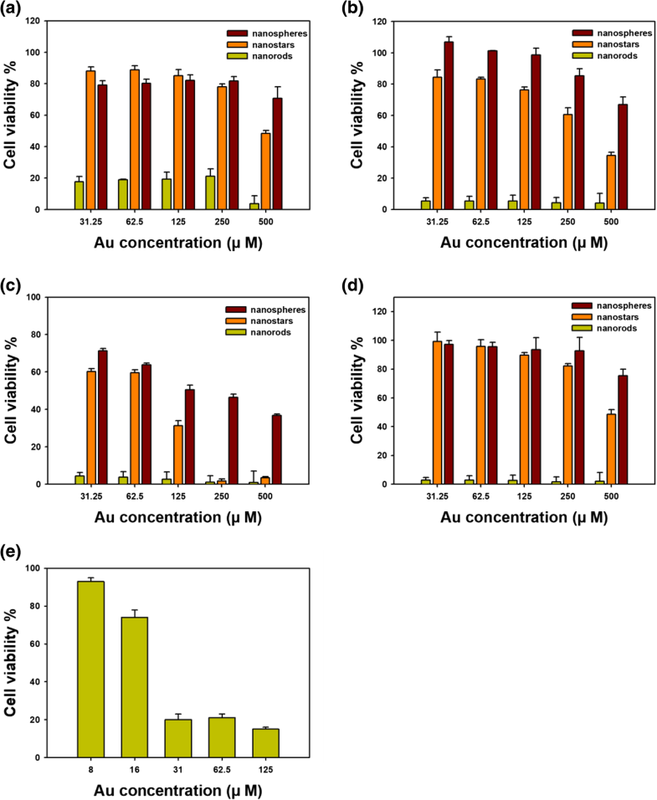 Extensive reviews have surveyed the green synthesis of gold nanoparticles (AuNPs) using plant extracts as reducing agents [2–4]. Using this green strategy, the synthetic step is performed in one step and in one pot. Furthermore, the process is simple, facile, cost-effective, and eco-friendly. 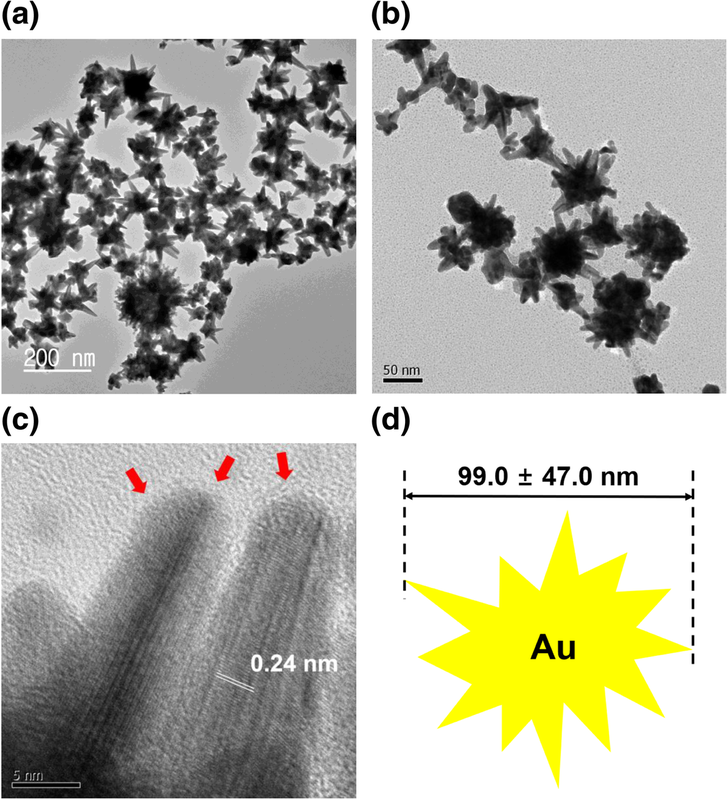 The size, shape, and topography of AuNPs are dependent on the concentrations of gold salts and extracts, reaction time, reaction temperature, and solution pH. 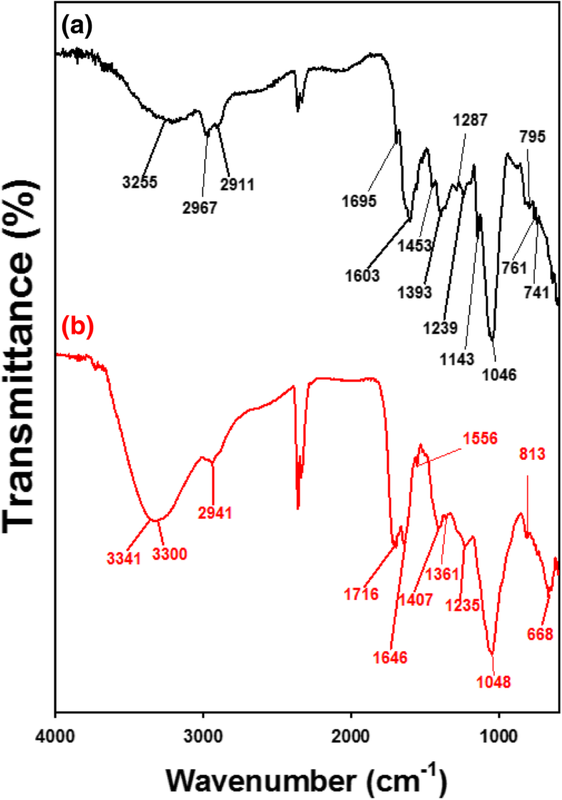 Spectroscopic and microscopic techniques are employed to characterize AuNPs, including UV-visible spectrophotometry, X-ray diffraction, Fourier-transform infrared spectroscopy (FT-IR), transmission electron microscopy (TEM), atomic force microscopy (AFM), scanning electron microscopy (SEM), and hydrodynamic size and zeta potential measurements. These green AuNPs are applied as catalysts, antioxidants, and antimicrobial and anticancer agents [5–8]. In the authors’ laboratory, plant extracts (Artemisia capillaris, Leonurus japonicus, Polygala tenuifolia, Caesalpinia sappan, Bupleurum falcatum, and Garcinia mangostana) have been used as reducing agents to green-synthesize both AuNPs and silver nanoparticles (AgNPs) [9–18]. The aerial part of A. capillaris was extracted and used for the synthesis of AgNPs and AuNPs [9, 15, 16]. The prepared AgNPs exerted excellent antibacterial activity against Escherichia coli, Enterobacter cloacae, Pseudomonas aeruginosa, Klebsiella aerogenes, and Klebsiella oxytoca compared with that of the extract alone . This result indicated that the synergistic effect of combining AgNPs and the extract contributed to enhanced antibacterial activity. Interestingly, AgNPs synthesized using A. capillaris in the presence of cetyltrimethylammonium bromide exhibited antibacterial activity against methicillin-resistant Staphylococcus aureus . Moreover, AuNPs synthesized using A. capillaries showed catalytic activity toward the 4-nitrophenol reduction reaction . L. japonicus extract was utilized for the synthesis of AgNPs exhibiting remarkable enhancements in antibacterial activity . We observed that antibacterial activity towards Gram-negative bacteria was greater than that against Gram-positive bacteria. The root extract of P. tenuifolia was also utilized for the synthesis of AuNPs and AgNPs [11, 17]. Enhanced anticoagulant activity and antibacterial activity were observed in AuNPs and AgNPs, respectively, synthesized using P. tenuifolia extract. Most interestingly, AgNPs synthesized using C. sappan extract showed effective antibacterial activity against methicillin-resistant S. aureus . The extract of G. mangostana produced asymmetric dumbbell-shaped AgNPs with apoptotic effects . Previous reports have examined the green synthesis of AuNPs and AgNPs using tea leaf extract [19–23]. Kamal and coworkers reported the successful synthesis of 25 nm-AgNPs . In another report, spherical AgNPs measuring 20 to 90 nm were synthesized using tea leaf extract . The synthesized AgNPs showed slight antibacterial activity against E. coli. Spherical AgNPs measuring 3.42~4.06 nm were also prepared by Loo and coworkers using tea leaf extract . 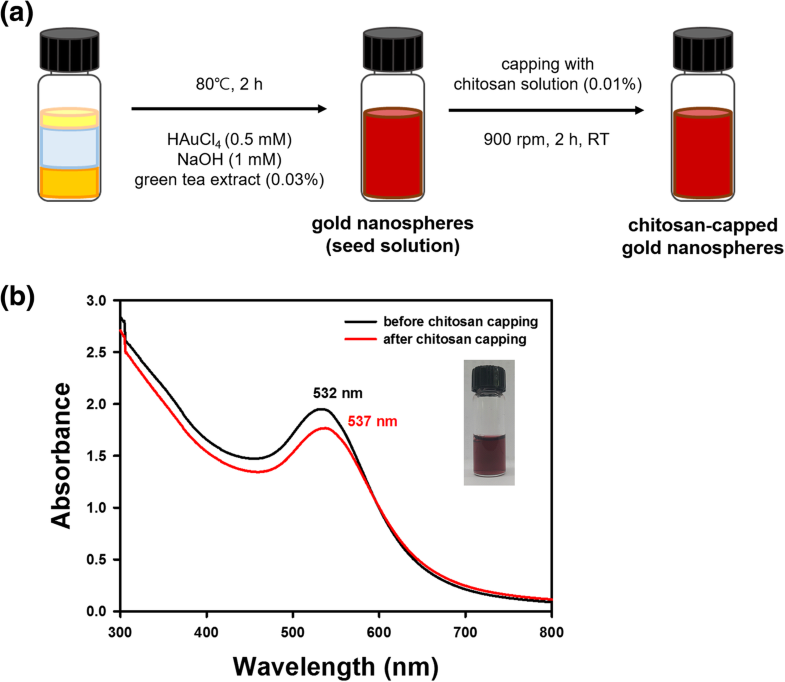 Vaseeharan and coworkers synthesized antibacterial AgNPs using tea leaf extract . The synthesized AgNPs were effective against pathogenic Vibrio harveyi infection. Begum and coworkers used black tea leaf extract to synthesize both AuNPs and AgNPs . To date, mostly spherical AgNPs have been synthesized using tea leaf extract. 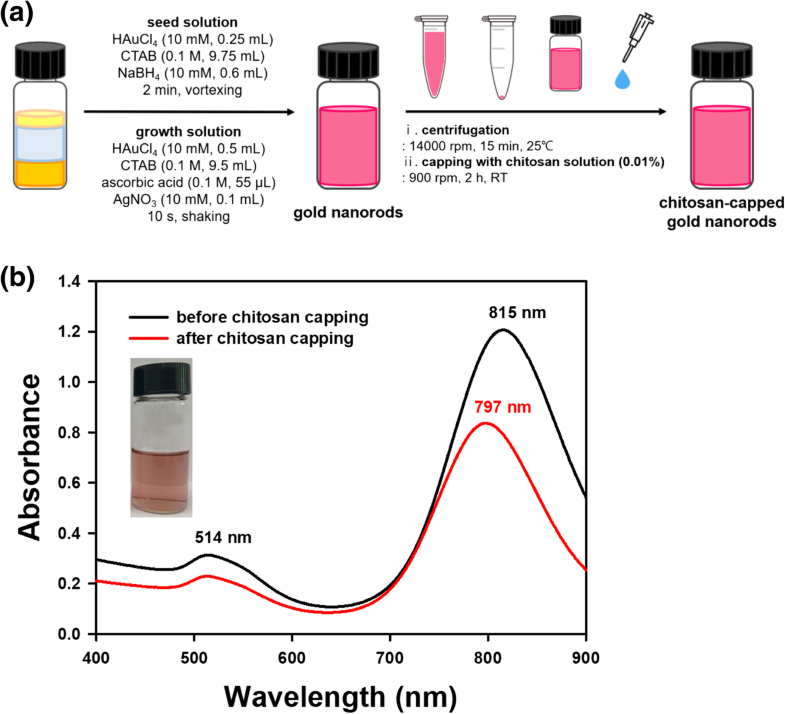 In the present report, chitosan was used as a capping agent for AuNPs. Chitosan has been explored as a drug/gene delivery vehicle due to its high biocompatibility, low allergenicity, biodegradability, and low toxicity [24–26]. Chitosan originates from chitin, which is abundant in the exoskeletons of insects and crustaceans such as crabs, lobsters, and shrimp. Chitin is a polysaccharide composed of N-acetyl-D-glucosamine linked by β(1-4) glycosidic bonds. Chitosan can be obtained from chitin by a heterogeneous N-deacetylation process. Chitosan itself possesses antibacterial, antifungal, antitumor, and antioxidant activity . As a capping agent, chitosan directly contacts AuNPs through an electrosteric mechanism . 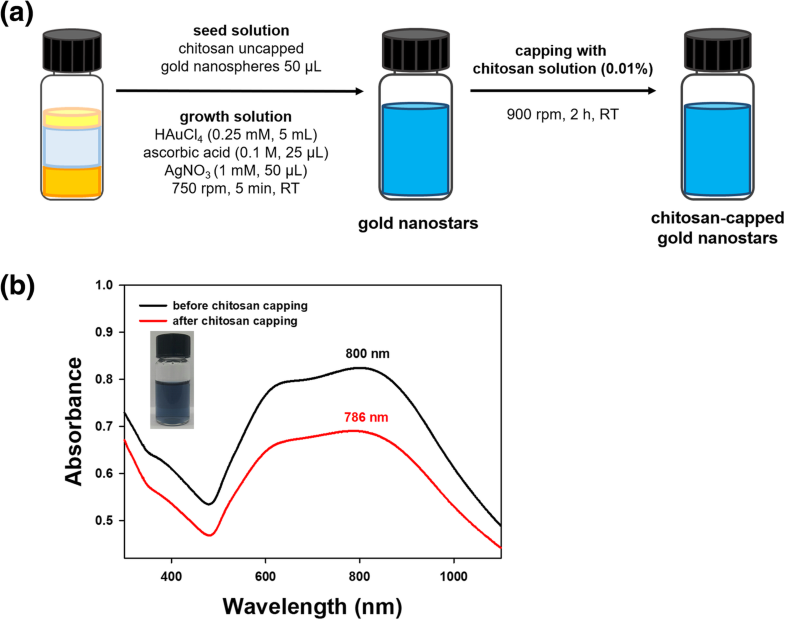 Chitosan nanoparticles affect the mechanism of cellular uptake by A549 cells without modifying cytotoxicity . Furthermore, the degree of deacetylation of chitosan is more influential than molecular weight on cellular uptake and cytotoxicity . It has been reported that the cytotoxicity of AuNPs is affected by size, shape, and surface charge [29, 30]. Favi and co-workers investigated the cytotoxicity of Au nanospheres (61 nm) and Au nanostars (34 nm) against two types of cells (human skin fibroblasts and rat fat pad endothelial cells) . 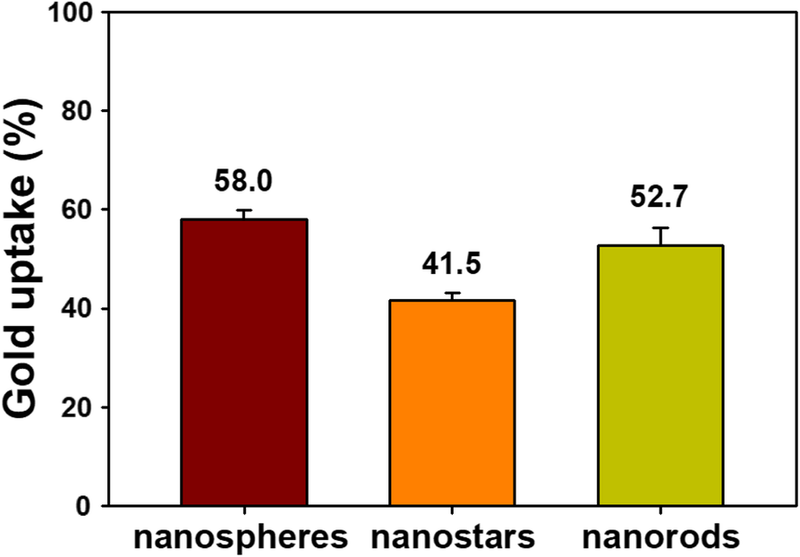 In both cell types, a lethal concentration was observed at 40 μg/mL for nanospheres and at 400 μg/mL for nanostars. Their results suggested that nanospheres were more cytotoxic than nanostars, suggesting that size, shape, and surface chemistry are most likely influential to the cytotoxicity of AuNPs. 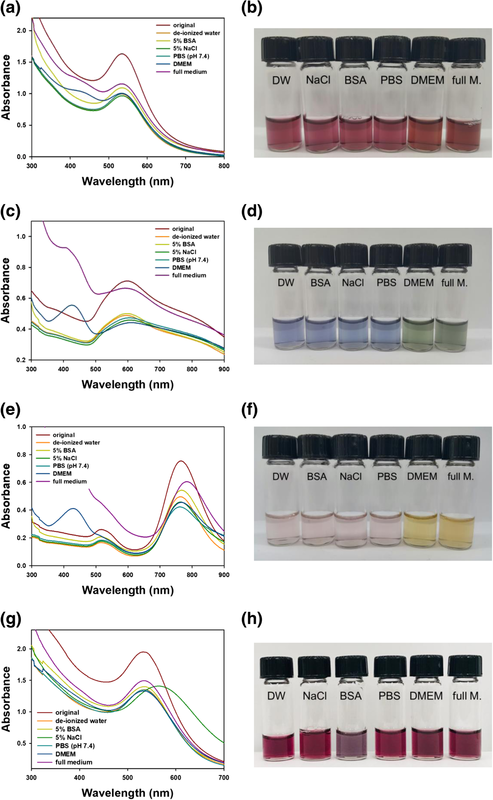 Woźniak and co-workers reported the cytotoxicity of AuNPs with diverse shapes against both HeLa and HEK293T (human embryonic kidney cells), namely, nanospheres (~ 10 nm), nanoflowers (~ 370 nm), nanorods (~ 41 nm), nanoprisms (~ 160 nm), and nanostars (~ 240 nm) . Interestingly, nanospheres and nanorods were more cytotoxic than nanoflowers, nanoprisms, and nanostars. 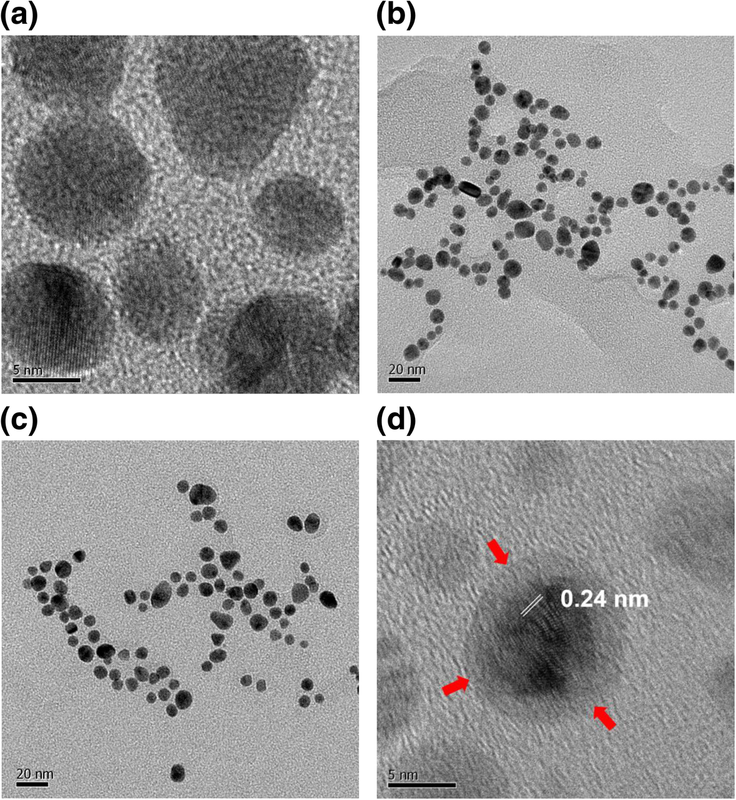 The authors explained that the small size of the nanoparticles and the aggregation process were the main driving forces for the cytotoxicity of nanospheres and nanorods in their work. Indeed, many studies have addressed the size effect of AuNPs on cytotoxicity [32, 33]. As AuNPs become smaller, their uptake by cells increases. This higher uptake results in a higher concentration of AuNPs in the cell, which leads to higher cytotoxicity against cells. However, a low concentration of AuNPs in the cell also shows high cytotoxicity . The concentration of AuNPs in the cell affects cytotoxicity; however, it is vital to consider and understand the characteristics of AuNPs. 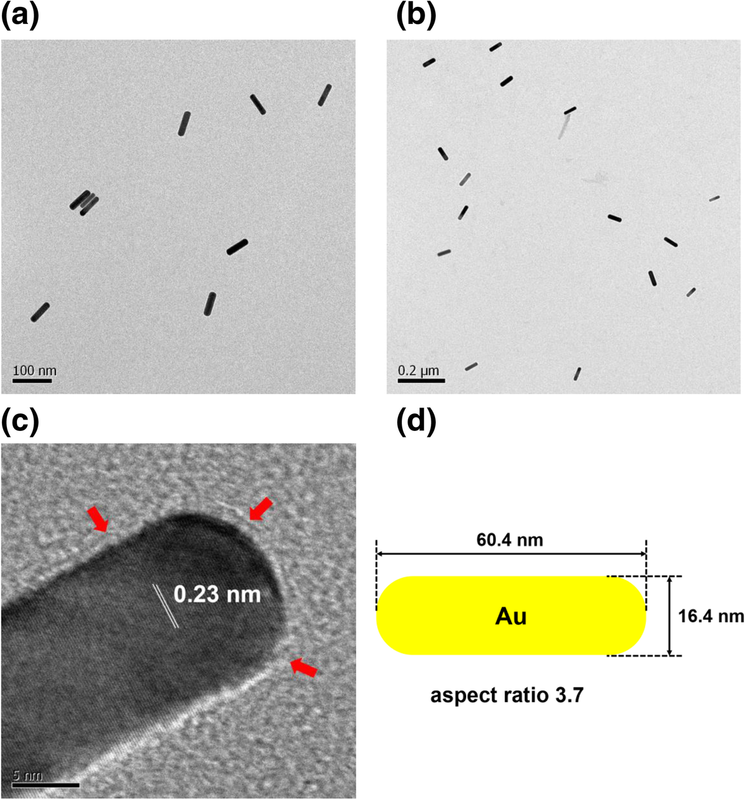 The cytotoxicity of AuNPs of two different shapes (nanospheres 43 nm, nanorods 38 × 17 nm) was evaluated in epithelial cells by Tarantola and co-workers . Nanospheres were determined to be more cytotoxic than nanorods. Furthermore, nanospheres induced a dysfunction in epithelial cell membranes, which was measured by electric-cell substrate impedance sensing . As previously discussed, many studies are currently investigating the cytotoxicity of different shapes of AuNPs in various cells. Although the shapes of AuNPs may remain the same, many factors still affect the cytotoxicity of AuNPs. When assessing cytotoxicity, factors including size, shape, physicochemical surface properties, concentration, exposure time, and cell type should also be considered [34, 36–38]. In addition to the characteristics of AuNPs, cytotoxic mechanisms including disruption of the cell membrane, oxidative stress, destruction of the cytoskeleton, and loss of mitochondrial function are also important [38, 39]. Currently, autophagy and lysosomal dysfunction are emerging as explanations of the cytotoxicity of nanomaterials . In lysosomes, nanomaterials induce cytotoxicity by lysosomal-iron-mediated oxidative stress and the release of cathepsins and other associated lysosomal hydrolases, which causes mitochondrial dysfunction and cell death. In the current report, nanorods were the most cytotoxic against the four types of cancer cells tested. Thus, our future work will examine the detailed mechanisms of cytotoxicity.